Don’t you love the refreshing high of finding South Asian inspiration in an unexpected place? If so, I’m pleased to present the Mumbai bon bon crafted by Chef Eric Cayton of Derry Artisan Church Chocolates. Chef Cayton spent over 25 years working as an Executive Chef and Pastry Chef before becoming a professional Chocolatier, and the Mumbai bon bon was one of his first creations. His collection of internationally inspired creations also includes chocolates named after London, Paris and Milan. Up close and personal with the Mumbai bon bon. Photo courtesy of Chef Eric Cayton. Based on the chef’s online surveys of customers, approximately 20%-25% of female clientele is of South Asian (primarily Indian), Chinese, or Japanese descent; most South Asian clientele reside in San Francisco, Los Angeles, and New York. Thrilled that his chocolates are so popular with desi women, Chef Cayton was eager to discuss his inspirations and experiences involving South Asian cuisine. Sapna: Can you tell us about your Mumbai bon bon? Chef Cayton: I have always thought that curry blends pair exceptionally well with many sweet dishes and ingredients. I love to play with curry blends because of the tremendous depth of flavor. 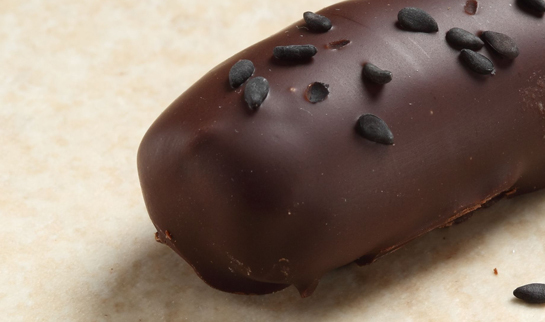 [The Mumbai bon bon consists of] sweet/ spicy curry, toasted coconut and coconut cream all blended into a superior white chocolate ganache and dipped into a deep, dark, complex bittersweet couverture and topped with toasted black sesame seeds. Yum! Sapna: You mention curry in your description of the Mumbai bon bon on your site. What is your favorite South Asian dish? Have you ever tried to cook any South Asian foods? Chef Cayton: I do actually cook a lot of curries and I particularly enjoy hot and spicy curry blends cooked into a coconut milk sauce. I will poach fish fillets or a whole fish in that sauce, on a very low heat… I usually buy red snapper or orange roughy if I can find it. Also, in Southern India, there is a dish called sambar… a very complex and unique type of vegetable stew cooked with pigeon peas and tamarind… so delicious and fulfilling. I make my sambar very hot and spicy with chilies, and I also serve it with my own homemade naan with toasted cumin and garlic! 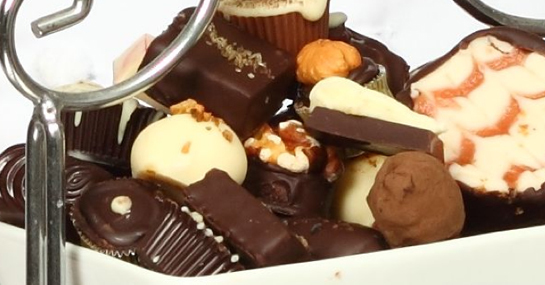 A decadent assortment from Derry Church Artisan Chocolates. Photo courtesy of Chef Eric Cayton. Sapna: That sounds delicious! Have you ever tasted any South Asian desserts? If so, what did you think? Do you have a favorite? Chef Cayton: As an American, unless you eat out frequently at high-end multi-cultural restaurants, you never even hear about all the lovely and creative dessert delicacies there are from the South Asian regions. I have tried my hand at several of these delicious treats, including boondi ladoo (a type of sweet doughnut made from besan flour and almonds and deep fried)… I steep them in a spiced sugar syrup! My absolute favorite dessert from South Asia has to be the Indian ice cream known as kulfi. I made it the traditional way a couple times, reducing sweetened milk and cardamom and then immersing it in an airtight jar inside an icewater/salt bath… The texture is sublime, and unlike any other ice cream I’ve ever had. 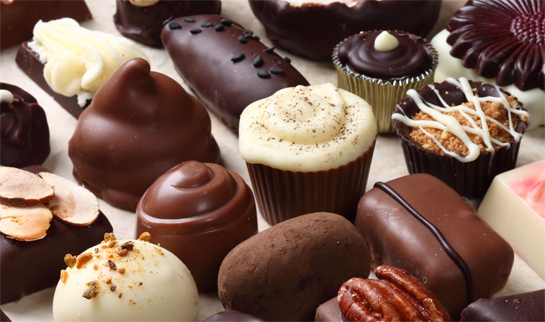 Sapna: Do you have any tips for our readers on how to use South Asian ingredients in Western-style chocolate desserts? Chef Cayton: The South Asian regions are home to some of the most diverse and complex culinary ingredients on planet Earth! Many of the spices that are so prevalent in the South Asian cuisines pair exceptionally well with all manner of Western-style chocolate desserts. You should never be afraid to try adding some of your favorite Indian spices to your brownies, chocolate cake or chocolate-chip cookies, because more often than not, you’ll be putting a new, refreshing twist on a tired old favorite! Learn more about Chef Cayton’s creations at derrychurchartisanchocolates.com.